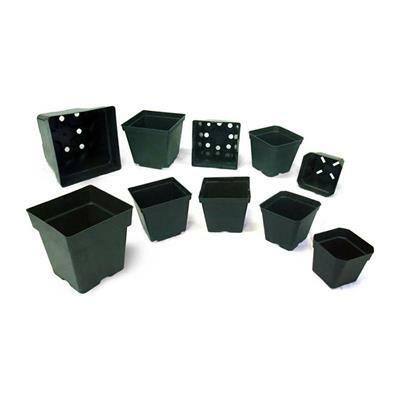 50 Count - Used in conjunction with Kord Square Pots, Cowpots, Coir Square Pots, or Jumbo Senior Square Pots, these rigid, non-cracking, reusable, injection-molded polypropylene carrying trays offer convenience and durability. Trays also feature drainage holes. Prompt shipping with great packaging. Delivered just as ordered. These square pot carrying trays are sturdy enough to probably get several uses out of them. Rating a 4 because they could be a bit thicker but good value overall. Trays were exactly what I was looking for and shipping was fast. These trays are much lighter weight than other trays I have purchased. They bend when picked up with watered pots. Edges have broken on several of the tray after short usage. Be careful and read closely. These only fit CERTAIN 5.5 pots. I was so hopeful these would help us in transporting but would not fit the 3 types of pots we have. My fault for not reading the fine print but it does say fits 5.5 pots. love the carrying trays... the 3.5 inch pots I ordered seem a little tight... other than that, they tray is well made.. Decent strength, accept the 4.5 sheet pots perfectly. Made moving larger plants around the greenhouse easy. I am using this tray with the 3.5inx3in square pots also from GHMS. They are fairly well constructed, which is why I docked a star - I was hoping that I could carry a tray full of soil (and watered) easily with 1 hand but I don't think that it could handle that. Even still, this is a very good tray for a very good price. 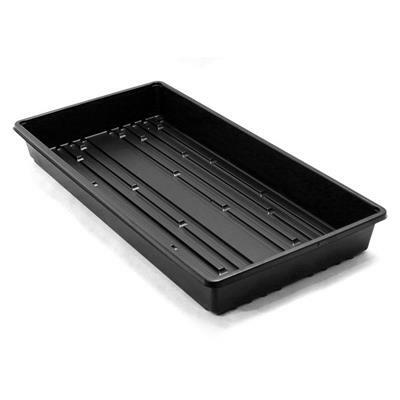 One tip is to use one of the black trays (for seed starting) underneath the tray to give it more strength, it fits perfectly and you can even use the clear dome lid when using to start seeds. Don't let the 4star fool you, this product is well worth the purchase. The trays are thicker than most any I have used. They fit the cow pots perfectly. They also have plenty of drainage slots in the bottom to prevent flooding. These trays were purchased to use with 4 Cowpots. The pots fit well in the trays. The trays are not quite substantial enough to support these pots when freshly watered. They seem especially fragile if picked up by the rim around the edges. I have found them to be more user friendly if you double them. Otherwise you will have to slip your hands under them to get adequate support and they'll still flex a good bit - enough for the pots to rock and fall out. Perhaps a little thicker, stiffer material and a deeper rim around the edges would help. The quality of the pots and trays I ordered are just fine, but I was surprised that the trays that reportedly hold 5.5-inch square pots have cavities that are too small for pots that are 5 3/8 square? 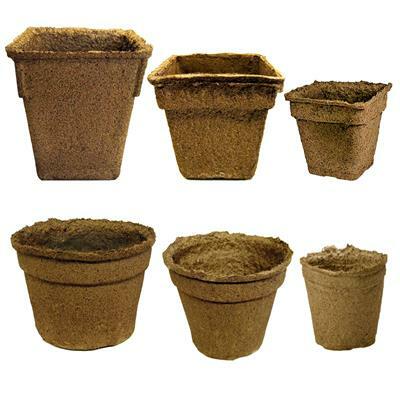 Fit pots perfectly with good drainage.Strong enough to lift when full of recently watered plants. 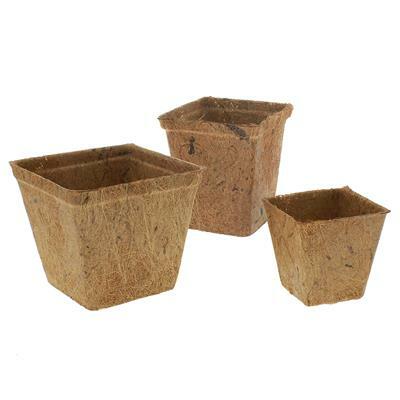 These trays work perfectly with the 4 Coir pots. They are sturdy and have drainage slots. Will buy again. I ordered these trays because they were advertised as being the trays to hold the green 4 square pots I ordered. The pots are slightly too large at the bottom to fit comfortably in the tray, and are tapered to be larger at the top, so they lean in the tray. I am absolutely not impressed with these, and am looking for a new supplier for both pots and trays in order to get some that fit together. Good basic tray for square pots. I wish it was slightly thicker for durability but with care it should last a few seasons. These 18 pot carriers were advertised for 3.5 in. pots. The pots did not fit well, crowding each other out at the top. They are perfect for 3.25 in. pots, but not really useable for 3.5 in. pots. Try it, you'll see what I mean. The pots are very crowded in this tray and barely fit when full. Flimsy. Not recommended. The trays offered last year were excellent. These accommodated the cow pots just fine for planting seeds. However they are a bit flimsy - when fully loaded with damp pots you need to use two hands to carry or you risk breaking the tray...wish they were a bit sturdier. 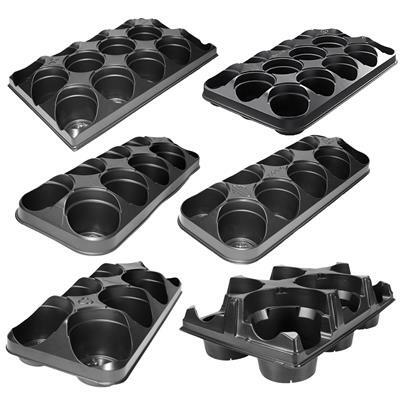 These pot trays are great! The carry trays are well made and hold the 3 1/2 inch pots perfectly. 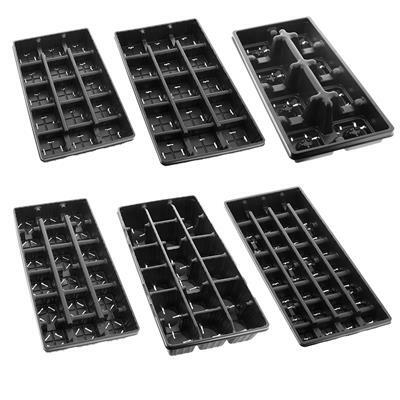 I bought these trays to fit the Square Injection Molded Pots (5-3/8) and while I must compliment the quality feel of the product, the pots fit too tightly and a bit uncomfortably in the trays. A tray filled with pots bows out as the pots push against each other. The trays aren't egregious, though, and for the right pots, it might be a wonderful product. 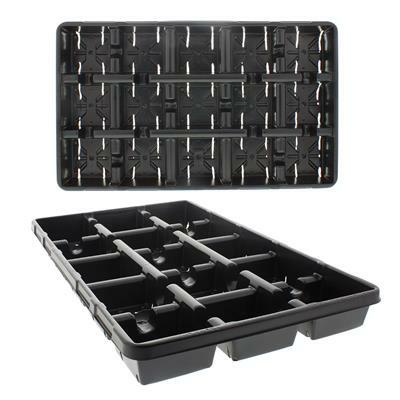 If you grow a lot of plants, especially taller plants like tomatoes, then these trays are a great product. The pots fit very snugly into the compartments and never tip over. The trays are also very durable and should last a long time if taken care of properly. Great product. I use these to hold my Cow Pots and they work great, very durable. I was not aware that there would be drainage holes in the trays. So, I inserted the tray in a very large plastic bag and formed the pot places. Now it is blocked from leaking both on the inside, and under the tray. The trays could be stronger. 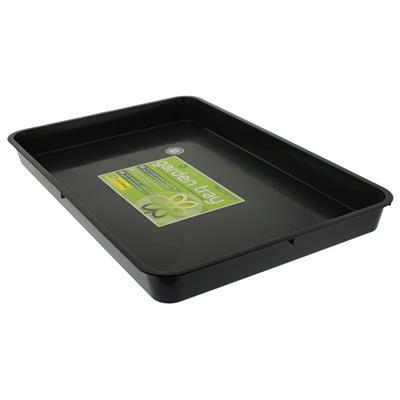 These square pot carrying trays are very sturdy heavy duty. Trays are strong and the 3 inch pots fit perfect!! Will be able to use for many seasons. These trays are sturdy and amazing! Delivery was prompt and quality was excellent! Will order again from here. We needed good carrying trays for lots of plants. Unfortunately these were not sturdy enough to carry 8 loaded pots. We had to restrict to 4 or 5 or the trays would crack. They were also not easy to carry as the edges are sharp. Item(s) in perfect condition and right on time as scheduled. I very pleased with the product as they are lightweight and perfect for portability. Thank you. I'll order from you again. I purchased enough of these trays to hold 800 of the 3.5 pots. I expected the flimsy plastic of other orders. This is NOT the case with these trays. The pots fit well and I am able to handle the trays full of potted plants with very little flexing. Highly recommend! This is my second order and works great! Product too thin, warped or broke when filled with plants. I am very happy with the trays and the containers I ordered. I ordered the incorrect tray for the pots by accident. They noticed it and called me to verify what I ordered and before shipping. That is customer service! Thanks a million! Nice tray for price. Kord 4 inch pots fit perfectly in tray. These trays are designed for the kord pots which I am rather fond of. The trays are a little more disappointing because they are a bit flimsy. You have to be careful when transporting full trays to support them evenly from underneath, but other than that they work well. Just what I needed for transplanting new seedlings. Great product, but not exactly what I was looking for...my fault, but is working out well anyway. Probably best used with Kord pots rather than Landmark, as the 3 Landmark pot rests 3/4above the bottom of the tray. That's a good thing in terms of air pruning roots, but weakens the tray once the pots are filled and makes the full tray difficult to carry. I'm wondering if I should be using some type of tray caddy with this tray. the trays hold up well even under full capacity. LOVE these trays! They work great and are useful for many things! Trays add stability to the square pots that I ordered. Make moving plants easier. Plastic is heavy enough to be reusable for quite a long time. I was skeptical at first but when product arrived I was impressed. It was everything promised and even more. Wish I had found this site earlier before I had invested in other brands. Very good quality. 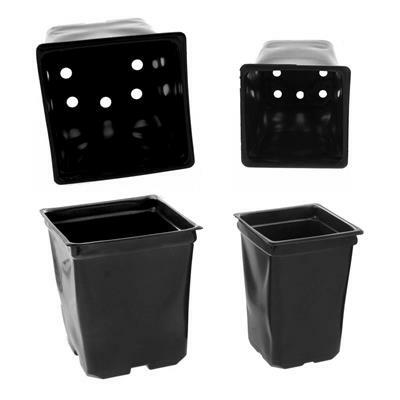 These trays, in conjunction with the Kord square pots, make growing easy! I love these for re-potting started plants before selling in the spring. The trays are sturdy and can be washed and reused many times over, yet they are economical enough to send along with the potted plants when a customer buys a full tray. Great products!! !